The corner of Graslei and Pakhuisstraat in the old center of Gent in Belgium. 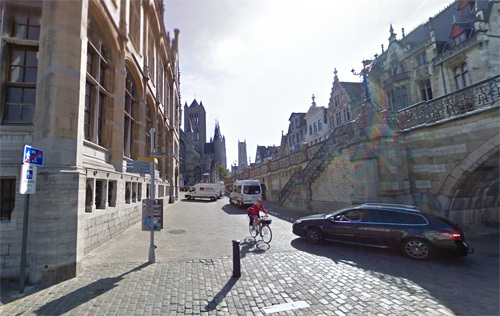 The Graslei is a street in the historical center of the Belgian city of Ghent. The Graslei is the quay on the right bank of the Leie. The quay and street on the left is the Korenlei. 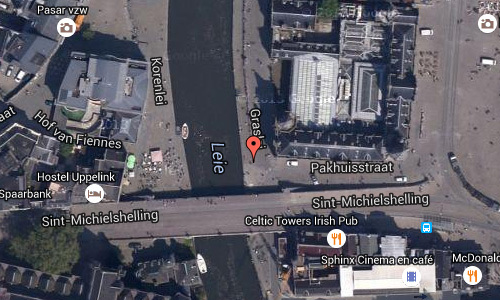 It lies between the Grasbrug and Sint-Michielsbrug. From the 11th century the growing trade along the quays and this became the city’s harbor. St Michael’s Church and St. Nicholas Church came from both sides of the Leie near the port created. Because of the grain pile right of the city, it happened all imports of grain in the County of Flanders and Ghent via the Grass and Korenlei were combined with the Korenmarkt the center of the grain trade in Flanders. Ask ten inhabitants of Ghent what the most beautiful place in their city is and nine will answer the Graslei. Today this medieval port with its unique row of historical buildings, which are reflected in the long river, is the meeting place par excellence. Young and old, inhabitant and visitor, everyone meets on one of the many café patios or simply by the water. This is the thriving heart of the inner city. The house of the Grain Weighers, the Guildhall of the Free Boatmen, the Spijker every house on the Graslei has its own history. 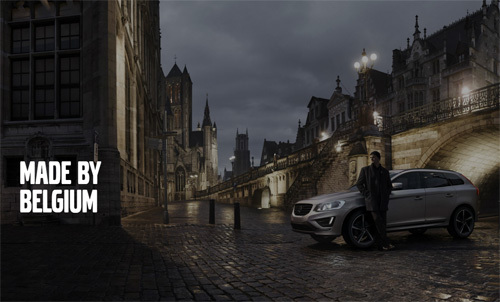 Together they form the story of the incredible blossoming of Ghent’s economy during the Middle Ages. On the other side of the water is the Korenlei. All that remains of some of the original buildings is the outer walls! Behind them is a brand new hotel. 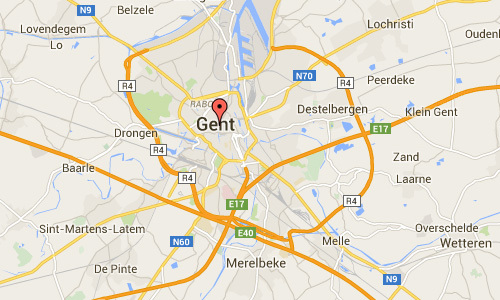 Ghent is a city and a municipality located in the Flemish Region of Belgium. 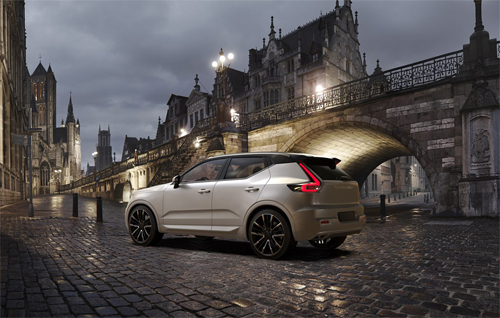 It is the capital and largest city of the East Flanders province. The city started as a settlement at the confluence of the Rivers Scheldt and Leie and in the Late Middle Ages became one of the largest and richest cities of northern Europe with some 50,000 people in 1300. Today it is a busy city with a port and a university. Much of the city’s medieval architecture remains intact and is remarkably well preserved and restored. Its centre is the largest carfree area in Belgium. 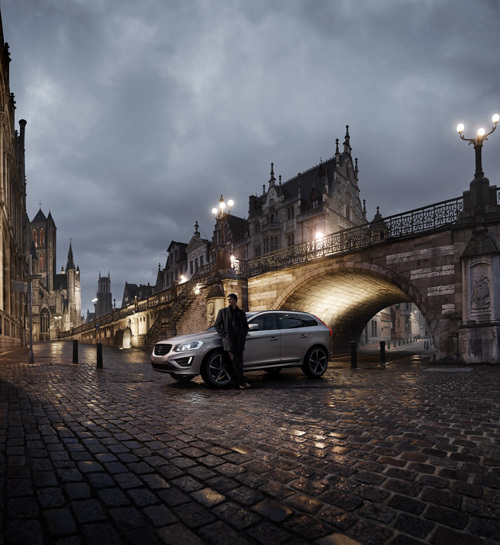 Interesting highlights are the Saint Bavo Cathedral with the Ghent Altarpiece, the belfry, the Gravensteen castle, and the splendid architecture along the old Graslei harbour. 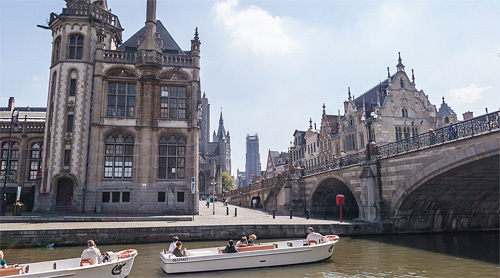 Ghent established a nice blend between comfort of living and history – it is not a city-museum. The city of Ghent also houses three béguinages and numerous churches including the Saint-Jacob’s church, the Saint-Nicolas’ church and the Saint Michael’s church. 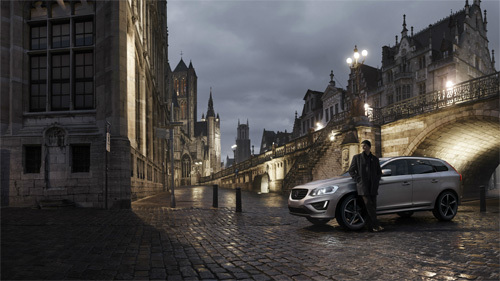 More information on visit.gent.be, www.volvocargent.be and en.wikipedia.org.